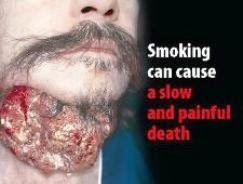 Cigarette smoke contains about 4,000 different chemicals which can damage the cells and systems of the human body. These include at least 80 chemicals that can cause cancer (including tar, arsenic, benzene, cadmium and formaldehyde) nicotine (a highly addictive chemical which hooks a smoker into their habit) and hundreds of other poisons such as cyanide, carbon monoxide and ammonia. Every time a smoker inhales, these chemicals are drawn into the body where they interfere with cell function and cause problems ranging from cell death to genetic changes which lead to cancer. This is why tobacco smoking is a known or probable cause of approximately 25 diseases. According to WHO figures, smoking is responsible for approximately five million deaths worldwide every year. However it also contributes to, or aggravates many other diseases and may play a part in many more deaths. Even the WHO says that its impact on world health isn’t fully assessed. WHO says smoking is a greater cause of death and disability than any single disease. By 2020, the WHO expects the worldwide death toll to reach 10 million, causing 17.7 per cent of all deaths in developed countries. People take up smoking for a variety of reasons. Young people are especially vulnerable because of pressure from their peers and the image that smoking is clever, cool or 'grown-up'. Just trying a few cigarettes can be enough to become addicted. Many people say that smoking helps them to feel more relaxed or cope with stress but nicotine is a stimulant not a relaxant, so it doesn’t help stress. What people are describing is more likely to be relief from their craving or withdrawal symptoms. There are hundreds of examples and volumes of research showing how cigarette smoking damages the body. For example, UK studies show that smokers in their 30s and 40s are five times more likely to have a heart attack than non-smokers. Smoking contributes to coronary artery disease (atherosclerosis or hardening of the arteries) where the heart’s blood supply becomes narrowed or blocked, starving the heart muscle of vital nutrients and oxygen, resulting in a heart attack. As a result smokers have a greatly increased risk of needing complex and risky heart bypass surgery. Smoking also increases the risk of having a stroke, because of damage to the heart and arteries to the brain. If you smoke for a lifetime, there is a 50 per cent chance that your eventual death will be smoking-related - half of all these deaths will be in middle age. Smoking does enormous damage to the lungs, especially because these tissues are in the direct firing line for the poisons in smoke. As a result there is a huge increase in the risk of lung cancer, which kills more than 20,000 people in the UK every year. Oral, Throat, Uterine, Liver, Kidney, Bladder, Stomach, Cervical and Leukaemia. Even more common among smokers is a group of lung conditions called chronic obstructive pulmonary disease or COPD which encompasses chronic bronchitis and emphysema. These conditions cause progressive and irreversible lung damage, and make it increasingly difficult for a person to breathe. Smoking in pregnancy greatly increases the risk of miscarriage, is associated with lower birth weight babies, and inhibits child development. Smoking by parents following the birth is linked to sudden infant death syndrome, or cot death, and higher rates of infant respiratory illness, such as bronchitis, colds, and pneumonia. Smoking is particularly damaging in young people. Evidence shows people who start smoking in their youth - aged 11 to 15 - are three times more likely to die a premature death than someone who takes up smoking at the age of 20. They are also more likely to be hooked for life. Nicotine, an ingredient of tobacco, is highly addictive – it takes on average on about six cigarettes before nicotine receptors in the brain are switched on, generating a craving for nicotine which may continue for the rest of the persons life. In less than one packet of cigarettes, a person’s brain can be changed forever from that of a non-smoker to a nicotine addicted smoker. Although the health risks of smoking are cumulative, giving up can yield health benefits, regardless of the age of the patient, or the length of time they have been smoking. If you join a proper smoking-cessation service, using all available help including medication and counselling, your chances of quitting may be as high as one in three (compared to just three per cent if you go it alone).